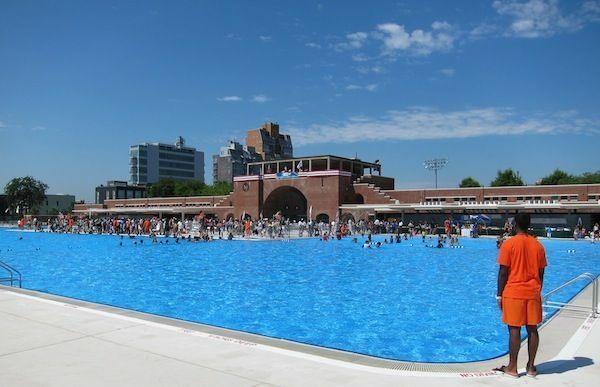 After sitting empty and mostly unused for decades, Williamsburg's McCarren Park Pool re-opened last week. In its new form, the pool -- which had a resurgence of interest in the mid-aughts when the empty, massive pool basin was transformed into a venue for summer concerts, featuring performances from bands including the Beastie Boys and Sonic Youth -- has been downsized from its original size of 55,000 square feet to about 35,000 square feet. The pool's main historic building, which used to house changing rooms and showers, has been converted into a year-round rec center with workout rooms, a basketball court and community meeting rooms as well as spaces for after-school programs and the parks department. 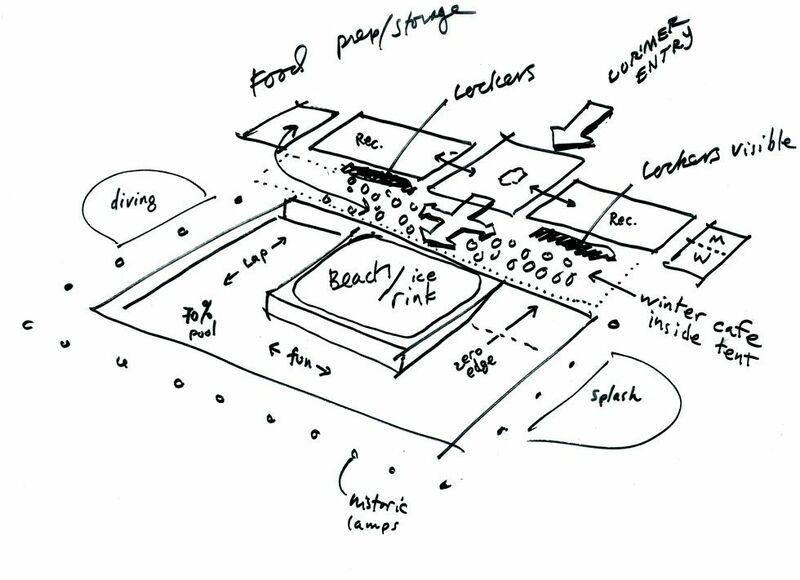 In the winter, a concrete peninsula which protrudes out of the entrance and into the pool, and which designers named "the beach," will be converted into a skating rink. 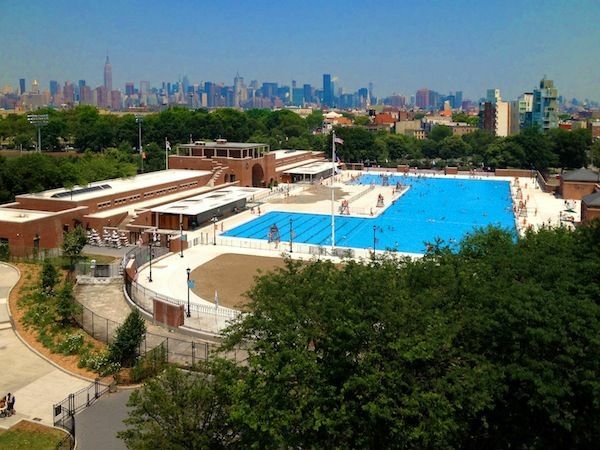 We recently chatted with the architect behind the McCarren Park Pool re-design, Scott Demel of firm Rogers Marvel Architects, about the new space and the renovation process. When did the renovation start on the pool? 2007. That's when we were awarded the project and that's when the funding was put in place by the Bloomberg administration. It had been so unused for the past twenty or so years -- the last swim season was in 1983 or 1984. The funding was unexpected by the Parks Department and they hadn't really pre-planned how they were going to re-invigorate the facility. We started with some preliminary studies and some community listening sessions to try and determine what the pool was going to be in its new life. The actual groundbreaking happened in January 2010. In 2007 the pool was in full-swing as an outdoor summer concert venue. It seemed like people who had become accustomed to seeing shows there were actually disappointed when it was announced the space was going to become a pool again. It was always going to be a pool again. That was always the agreement with the community board and with the local neighborhood, even before it was closed. Because when it was initially closed in the '80s, there was some contention about how to get [a renovation] done and there were some financing problems from the city itself and the whole project just got shelved. It sat for a long, long time. I think during that twenty year-plus span, people forgot that it could actually hold water. In 2005, when Noemie Lafrance's "Agora" was staged in the basin, that production ended up really bringing some attention to the space. And the concerts evolved from that. And then it really became known as this performance venue, but it was just missing water. A peninsula in the center of the pool will be converted into an ice skating rink in the winter. Photo Â© Rogers Marvel. 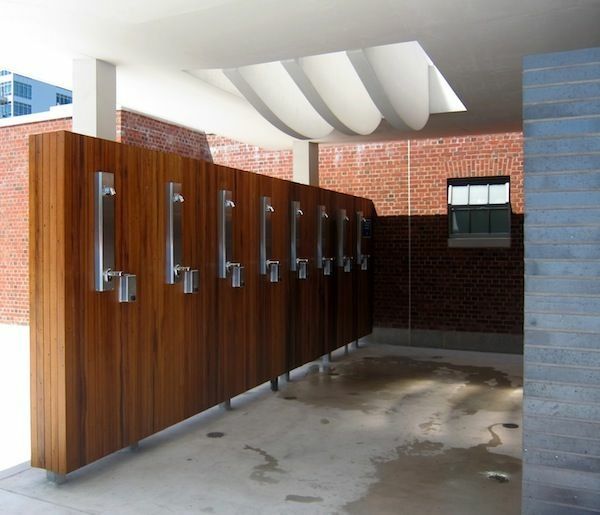 Outdoor showers. Photo Â© Rogers Marvel. When you renovated the historic building, was anything interesting found or recovered in the process? There were also all of these baskets from the changing areas that were laying all over the interior. It used to be that you'd go in, change, and you'd give your clothes to an attendant and they'd give you a little brass ticket and hold your stuff for you in a basket. We collected a few thousand of the baskets and we re-painted and re-galvanized them and hung them from the ceilings in the entryways and in some of the main spaces. And there's also wood from the Coney Island boardwalk incorporated in places, right? The parks department was renovating the Coney Island boardwalk and we took that wood to the pool and resurfaced it and installed it through out the interiors on the building. Any wood you see on the walls inside is Coney Island boardwalk wood. The pool also accommodates fewer swimmers than it used to. Is that because of safety issues? A big portion of the reason we wanted to have it accommodate fewer people is that it just makes it easier to manage and easier for lifeguards to handle. 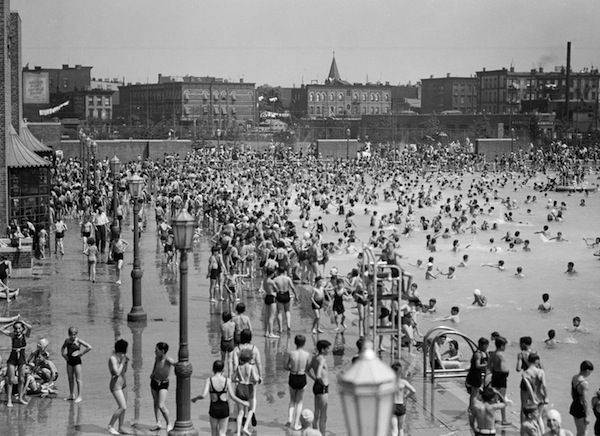 If you read the historic accounts, the McCarren Park Pool was designed to handle 6,000 swimmers at once, which is an amazing crush of people. And which is actually probably not that different from the crush of people that you would have seen at one of the concerts happening there five or so years ago in the middle of the pool basin. By the current department of health standards, if we had used the existing pool basin, we could have had about 2,200 people in the pool. In its current configuration the pool handles 1500. McCarren Park Pool, July 12th, 1937. Photo courtesy of the NYC Parks Department. Redesign plans. Photo Â© Rogers Marvel. Was there anything that was particularly challenging about the renovation? This project had every challenge we could come up with. It was a structure that had deteriorated and been unused for a very long time. It was a historic building, so there were a lot of compliance issues we had to work with. And we had to work closely with the New York City Landmark Preservation Commission, which was really successful, to meet restoration requirements. And it's a swimming pool, so there are all of these waterproofing issues we had to deal with in renovating an old pool shell that was all cracked and deteriorated and to bring it back up to today's standards. When you were building the space, was there anyone specific you envisioned using it? No. Any person who wants to go swimming can show up at the front gate, walk in and be swimming.